It is 1,000 times smaller than previous, similar devices. Advances in optical quantum networks, which transmit information by encoding data via the quantum state of photons, have been leading to breakthroughs in quantum photonics such as the recent demonstration of quantum communication in real-world conditions. However, because qubits are delicate, despite their ability to store vast amounts of information, a massive amount of effort is now being poured into the development of reliable, practical quantum memory schemes that might eventually be able to be scaled down to chip-sized quantum devices. Recently, researchers at Caltech took some significant steps in this direction. The team created an optical quantum memory device over 1,000 times smaller than anything developed before. This device is even able to fit into on-chip devices and, according to their published results, it is also capable of on-demand retrieval of stored data. 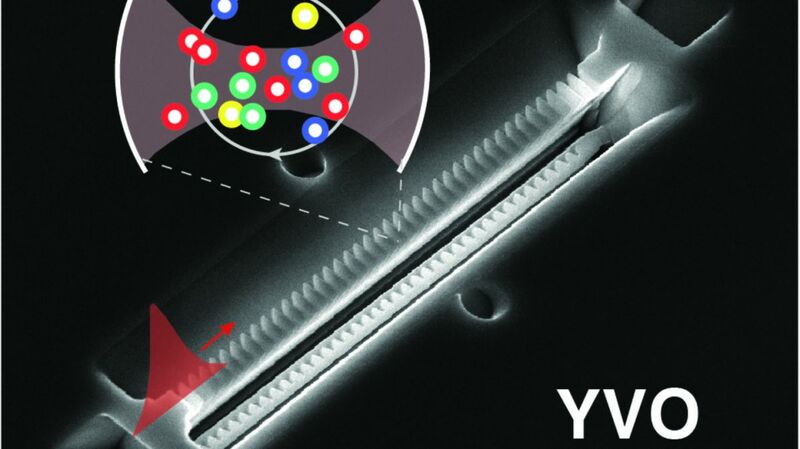 The research team developed a nano-sized cavity containing light-trapping, rare-earth (or lanthanide), neodymium atoms which are trapped in a yttrium orthovanadate (YVO) crystal. The cavity, in turn, creates a crystal cavity which enhances interactions between neodymium and light at the level of single photons. This technology may take us closer to the quantum internet because it makes both on-demand retrieval and high-fidelity memory a reality. The other major advancement here is scale. Systems that offer high-fidelity storage of quantum memory already exist at macroscopic scales, which isn’t good enough for practical quantum computing. Information processing, as we understand and use it, relies upon functioning at the micro and nano scales. “The nanocavity scheme demonstrated here enables versatile engineering of the quantum light-matter interface, and offers the unique advantage of faster and more efficient memory preparation,” the researchers concluded. The nanocavity design makes it possible to envision practical medium- to large-scale quantum memories such as those that would be necessary for implementing a quantum internet. Next steps for these researchers include rendering their device more practical for commercial use. For example, the current fabrication process, which relies upon ion beam milling, is slow. The team hopes to find a more scalable solution and to improve both the storage time and memory efficiency of the device.